An excellent new book from prolific preacher John MacArthur. 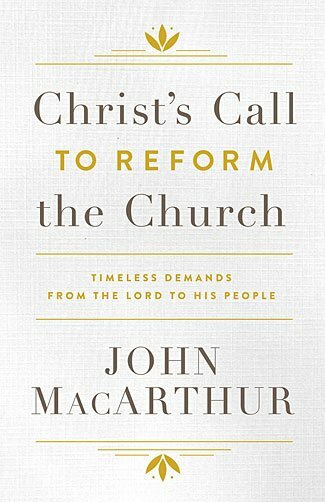 Tireless preacher, respected scholar, administrator, and also author (with over 350 titles to his credit, ranging from shorter length works to massive Bible commentaries) John F MacArthur has just released his latest book, “Christ’s Call to Reform the Church : Timeless Demands from The Lord to His People”. This 185 page work boldly wades into the most enigmatic of the books in the Bible, Revelation, and looks at the seven letters to the seven churches therein. In Revelation, these seven letters (in Revelation 2-3) are addressed to churches by the names of the cities they were located in, but MacArthur restyles these as being churches that were loveless, persecuted, compromising, corrupt, dead, lukewarm, and (at last!) faithful, and takes the lessons from these very short letters and applies them to modern-day churches and the failings MacArthur sees within them. MacArthur writes with practiced skill, clarity and confidence. He wastes no time before attacking erroneous popular misperceptions. He doesn’t even complete the first page of his introduction before stating there has never been a Christian nation – neither the US (now or formerly) nor any other. His reasoning is convincing. Turn the page and you discover a startling heading – “Morality Damns”. How can that be, in a book advocating Christianity? Again, his reasoning and explanation is convincing. From this we take a sudden dive into the underpinnings of the Reformation, although MacArthur surprisingly offers up the fable of Martin Luther actually nailing his 95 Theses (see our modern translation of them here) to the church door – it is now generally thought that while Luther did indeed write the theses, the story of them being nailed to the church door is just that – a story, rather than a fact. MacArthur brings up a fascinating point. Some long-standing churches rely heavily on the concept of their tradition as validating their beliefs and worship systems, and will proudly trace their lineage back to the days of the “early churches”, whenever/whatever that is. There is definitely an increasing vagueness about what and when the actual early churches were as one moves further back that perhaps the First Council of Nicea in 325 which started to set out formal statements of Christian belief. MacArthur points to the truly early churches as being flawed rather than perfect – we see the anxious chiding on the part of Paul in his epistles, and then, which MacArthur moves to focus on, in John’s Revelation as well. If the churches were already deviating (in some cases greatly) from core fundamental Christianity within a generation or two of Christ’s teaching and resurrection, just how valid are the claims of long-standing traditions? MacArthur then devotes a chapter to each of the seven short letters to the churches from the Book of Revelation. He goes through the text of each letter verse by verse and explains and expands upon what is written in Revelation, making the issues clear and then showing their relevance to present churches too. But we feel it would have been also helpful to open each chapter with a complete statement of each letter, to enable us to quickly read the text in its entirety prior to his analysis. After seven chapters on the issues discussed in Revelation, MacArthur closes with a chapter on “The Need for a New Reformation”. In fact, as he quickly reveals and advocates, the “new” reformation he calls for is nothing more than a return to original first principles and to pursue more faithfully the ideas of the earlier Reformation that started in 1517, and the “Five Solas” they advocated. It is hard to single out one of these five points for special mention, but MacArthur starts with and dwells on “Sola Scriptura” at length – the concept that scripture alone is the sole, sufficient and ultimate authority for everything to do with the Christian faith. MacArthur further states that this concept is strictly limited to the original canon of scripture – the 66 books of the Bible – and excludes any additional material subsequently offered by new self-proclaimed prophets. Like many of his books, this is a collection of sermons that have been integrated and rewritten into a cohesive entirety. It flows well, and is an easy read that could readily be consumed over a single weekend. MacArthur’s reasoning is clear, easy to follow, and hard to refute. While ostensibly written for church preachers, leaders and elders – those who can shape a church’s teachings – it is useful for all, giving church members a better ability to discern the validity of their church and how to respond. John MacArthur is one of the most respected and persuasive voices in the conservative church firmament today, and one of the authors of the recent Statement on Social Justice and the Gospel. This latest book is a good example of his work and a restatement of some of his core messages.. The slim book features large clear black text with headings in gold. There are no pictures or other illustrations or tables. It is hardcover, with the hardcovers measuring 5 3/4″ x 8 3/4″ and being about 5/8″ thick. It was first published in 2018 by Moody Publishers, Chicago, IL. It can be purchased on Amazon in either Kindle or hardcover format for $9.99 or $14.99 respectively, and has a list price of $19.99. Currently it is also available on the MacArthur associated website, Grace to You, for $12.50. We think that might not include free shipping on the Grace to You site. There are a limited number of footnotes, with the footnotes appearing not on the relevant pages nor at the ends of chapters but at the very end of the book. We prefer footnotes on each page, but this is hardly a fatal weakness of the book’s layout. What is annoying though is that the footnote numbers restarts at 1 for each new chapter, meaning that when you go to look up a footnote you first need to work out which chapter you are in – again, not a fatal weakness, but a gratuitous interference with reader friendliness that could easily be avoided. Most of the many Biblical quotes are from the 1995 NASB translation (we’re always fascinated to see which translation people prefer to use). In summary, this is an excellent approachable book. It helps us better understand part of Revelation, and it helps us also understand how our modern churches may be falling short of Christ’s requirements. Most of all, it helps us understand how to correct the failings in our churches. Recommended.